The Reservoir: A soft surface made of crushed gravel, the Stephanie and Fred Shuman Reservoir Running Track is a 1.58-mile loop offering some of the Park’s best views of the midtown skyline. Central Park Conservancy recently renovated the track to improve the drainage and regrade the surface, which has drastically improved the running experience for all. *For your safety and for the safety of others, please run only in a counterclockwise direction around the track. Dogs, strollers, and bikes are not allowed on the track at any time. Bridle Path: Runners can choose from three conjoined soft surface dirt routes: The Reservoir loop, adjacent to the Reservoir Track, totals 1.66 miles; the North Meadow loop totals 1.1 miles; and the southern spur totals 1.5 miles. *Dogs must be on-leash at all times on the bridle path. Park Drives: Circling the entire Park, the paved drives provide the Park’s longest routes – 6.1 miles or 5.2 miles. 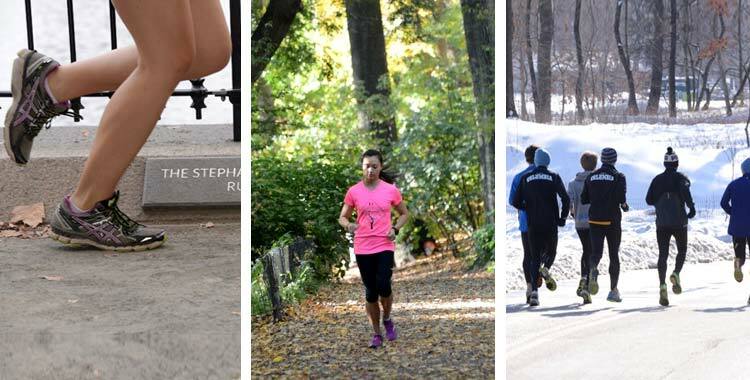 Join Team Central Park to earn guaranteed entry into some of New York’s premier road races, including the New York City Marathon and Half Marathon. In exchange for guaranteed entry, runners will raise funds to support the Conservancy’s mission and have access to special benefits; including an official Team Central Park performance tee shirt and invitations to pre-race training sessions and special Conservancy in-park events. To learn more about Team Central Park, click here.